Throughout our history, mankind has created tools the same way, essentially using the top-down approach. Think about it. In the stone age, a sharp cutting tool was fashioned by using a larger stone to chip away pieces until the cutting stone was sharp enough. Today, a computer chip is made by a large laser that etches the circuits into a piece of silicon. What makes nanocrystals so attractive to researchers is the fact that the properties essential to allow the arrangement process, including their size, shape, surface protection, stabilization and charge, can be controlled along with the electronic structure of each nanocrystal. As an example, we developed a "lab-in-a-drop" technique where a variety of nanostructures with desired properties may be produced. We describe superstructures that extend over macroscopic dimensions. There is no principle upper limit for the area to be covered, making "lab-in-drop" a promising candidate for the fabrication of technological important materials. 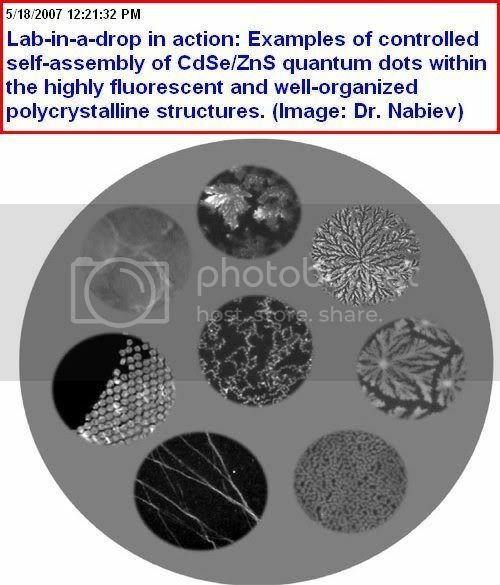 Our future work will include development of new, self-healing polymers based on nanocrystal self-assembly, applications of designed nanostructures to biophotonics, and to engineering of energy-harvesting and energy -transfer nano-devices operating in a FRET (fluorescence resonance energy transfer) regime. This article and many others like it, scattered about in technical publications and too little noticed by the popular press, are describing the inexorable assembly of the techniques and infrastructure of our future world. They are, in effect, sketching out the framework upon which the singularity will be built. It's fun to follow along and stay tuned.